Michele Lupo's second in his gladiator trilogy that began with the sweeping tragedy of The Revenge Of Spartacus, 1964 and concluded with the lively brain-dead fun of Seven Rebel Gladiators, 1965. Here, Roger Browne returns, this time as Marco Aulo, a character he would reprise in the third film. Gordon Mitchell, Giacomo Rossi Stuart and the stunning Scilla Gabel also encore for this second go round. Browne plays a Roman tribune sent to Africa to write a report on the progress of an aqueduct under the command of the vicious Gaio. The cruel centurion doesn't like the meddling Aulo and orchestrates an elaborate scheme to frame the honorable tribune for a mass slave revolt that leaves dozens dead. Marco is arrested, but escapes and joins up with rebel slave Bilisten, played by Gordon Mitchell. Some time later, the seven men secretly infiltrate Rome as masked gladiators in order to exact revenge on Gaio. The film may be told on a slightly smaller scale than before, but the plot is no less convoluted with numerous instances of subterfuge and treachery spread throughout. The costumes of the seven warriors are an unusual design. The action is well staged, performances are strong and there's a modest sense of humor here. 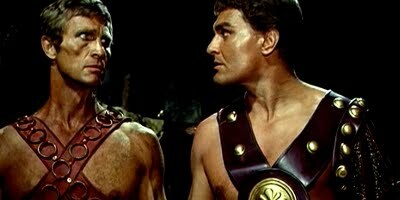 This sadly obscure entry is well worth tracking down for gladiator movie fans.